It’s fairly obvious from reading our website that I like to read, and I really like hockey. So, when I found a book that was about hockey, it was destined to be a part of my reading list. Add to that the fact that the author, Fredrik Backman, also wrote one of my favorite, recent books, and you have an equation for another fantastic book review. 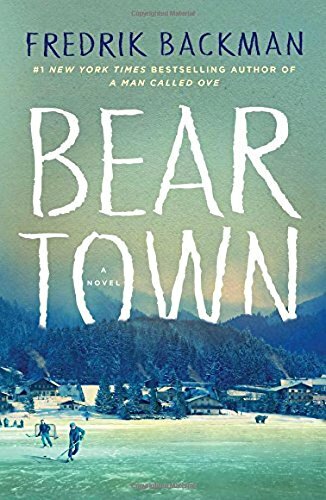 Beartown, by Fredrik Backman is the story of a small town in Sweden that is slowly being taken over by the encroaching forest and the lack of jobs. The one thing the town has going for it is the junior hockey team, the team that is playing for the title. The teenage boys who make up the team are revered by the people of the community. How far will that reverence go when something ugly rears its head? Will they protect the players, or will they turn their backs? This is a story about a town. Beartown is a character unto itself, and it is the leading character in this story. Small towns have a heartbeat. Collectively, the people who make up a community provide that heartbeat. In Beartown, hockey pulls the town together. The teenage hockey players and the girls who follow them drive the town’s narrative, with the adults relegated to a less prominent, though still important, role. Beartown is giddy with excitement as their junior hockey team prepares to play in the semi-finals. It’s been two decades since the last championship, and this year’s incarnation might be the one to match the splendor of those glory days. The players are riding a wave of popularity and invincibility as they skate toward their goal. They are so invincible that teachers at their school are urged to turn their heads when youthful exuberance takes control of the classroom. In the midst of all the fanfare as the team wins the semi-final game and moves onto the championship, one of the players makes an unfortunate decision which will have resounding effects on the town and the team. In a rush to judgment, the town is divided on whether to support the player who has done a dastardly deed, or to pull behind the life that has been destroyed. Friends and even family are divided. Hockey has its own drama. From the ice, where the players vie to be on the number one line, and to defeat the opposition, to the front office, where popular coaches have to be let go to ensure better results for the new season, Backman has captured its very essence. The general manager wants to keep his beloved coach in his position, but he wants to win. All the while, he wishes he could just get back on the ice where he knew he was in control of what was happening. Teenagers struggle with expectations by their parents and try to reconcile that with their own. Values instilled are questioned, and the constant search for approval from peers and adults underlies almost all their decisions. All this is captured by the author. Even with a large cast of characters, Backman is able to give them all a unique voice that resonates throughout the maelstrom that dominates life in Beartown. The town, against the background of all this action, hopes to survive beyond the next hockey game. They love their hockey, but they yearn to be something more. All the jobs are going to the city, but there is a chance that a hockey academy can be built there if the boys come home with the trophy. The very life of Beartown could rest upon the shoulders of a group of teenage boys and their coach. I have read a couple other books by Fredrik Backman. I have loved them all so far. Beartown is vastly different from the previous books by this author. The narrative is just as engaging, but it is something different. It seems richer than the other books. Maybe that’s because the subject matter is so far from what he’s written before. At any rate, I think this book is a fantastic book. I read it in two sittings. In between, I went to a hockey game. Hockey is a passion, which made this book that much more intriguing. You do not have to like hockey to like this book, but if you do, there is so much more to enjoy while reading. Craig Bacon loves reading and he loves hockey. Reading about hockey is simply awesome.